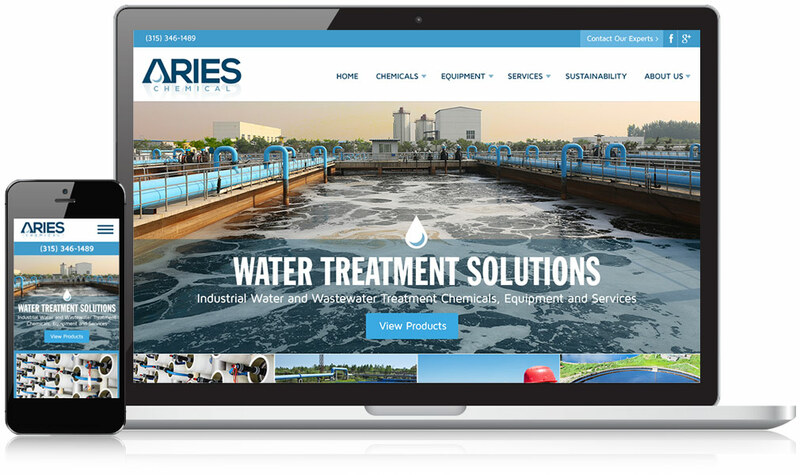 Home » Results » Web Design Portfolio » Aries Chemical, Inc.
Aries Chemical, Inc. provides water treatment solutions to industrial and municipal clients throughout the U.S. Despite a solid reputation for delivering expert services, high-quality products, and reliable solutions, the existing website wasn’t a clear reflection of the Aries brand. After taking a deep dive into their business, goals, and competitive analysis, we set out to create a modern, user-friendly, easily updatable website designed for enhancing the way Aries Chemical communicates with their audience. Custom Website for Aries Chemical, Inc. The modern navigation menu and prominently displayed calls-to-action provide a smooth path for conversions, allowing visitors to flow through the home page and deeper to the interior pages of the site. When potential customers are ready to start a conversation with Aries Chemical, they can quickly and easily fill-out a short contact form which passes their information along to Aries’ team of knowledgeable specialists. While many industrial websites tend to be heavy on the use of text copy, today’s buyers are “visual learners” which means sellers need to incorporate high-quality images into their site. We designed the new Aries Chemical website with better imagery to provide a crisp, clean, and professional new look, while using proper amounts of whitespace to help balance out the text copy, images, calls-to-action, and contact forms. To improve the display of information throughout the new custom designed website, our developers created visually appealing layouts for multiple sections. 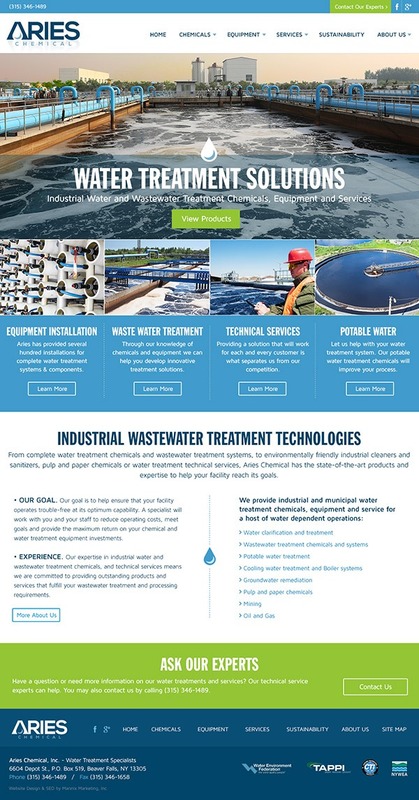 Enhanced functionality lets potential customers easily segment case studies by category so they can find the ones that are most relevant to their industry and water treatment needs. Internally, the process of managing all of this content and adding new case studies to the website is easier than ever through a user-friendly content management system. Finally, the new responsive website lets Aries Chemical breathe easy in knowing that it provides a user-friendly experience for desktop and mobile visitors.